“How We Changed the Law to Make the Real Polar Beer” is the official slogan of the world’s northernmost brewery, but it takes one of the 2,000 residents of the Norwegian town of Longyearbyen to understand it. I first saw the words in the middle of winter on a T-shirt worn by Svalbard Bryggeri’s brewmaster, Andreas Hegermann Riis, a laid-back, bearded, 30-something Norwegian sporting an Aussie hat and perennial smile. After pouring me a glass of his Spitsbergen Weissbier, made with meltwater from snow and glaciers, Riis explains the story behind the saying. Life had always been hard in the Svalbard archipelago, with its abundance of prowling polar bears and punishing arctic weather, but nearly a century ago, authorities in this former company coal town limited miners and all residents to 24 cans of beer per month and two bottles of spirits. It was the only way to keep everyone sober, especially during the long, dark winters. Another law banned breweries altogether. Eventually times changed, but not the laws. That’s where the Svalbard Bryggeri owner, Robert Johansen, entered the story. Before becoming a commercial pilot, Johansen spent 12 years drinking plenty of beer in Svalbard as a coal miner in—yes, you guessed it—the world’s northernmost coal mines. “He had to call the health authorities in Oslo once a month for five and a half years until they caved in,” Riis tells me. In 2014 the ban on breweries was finally lifted, but locals are still limited to two cases of beer, and even tourists must show plane tickets to purchase packaged alcohol. To get started, Johansen recruited Riis from a brewery consulting career in Drammen, southern Norway’s venerable beer capital. Production began last summer, and since then Riis has produced seven different beers using three different yeasts, including a few specialty brews. Being in a ridiculous place has its costs, such as shipping waste grains back to the mainland to protect the fragile and pristine arctic environment. Riis and Johansen are building a furnace that will burn the grains and fuel the brewing process, saving on both shipping and electricity. Any excess steam will be pumped into Longyearbyen’s home heating grid. Another challenge is getting the grains here in the first place. When I visited in late January, the last boat for another month had just sailed off into the endless dark of the polar night. With plenty of media attention and a full summer tourist season ahead, “the real polar beer” is well on its way to success. Riis and Johansen plan to brew over 200,000 liters this year, up from 60,000 liters the first year. Folks headed north by cruise ship or the three-hour Oslo flight should remember that the archipelago’s 3,000 “real polar bears” still outnumber people and that rifles are required beyond town limits. In fact, cars and houses are traditionally left unlocked in case the occasional unwelcome furry visitor wanders by and a human needs quick shelter. That said, bears and nature are part of Svalbard Bryggeri’s very brand. If past is prologue, Riis shouldn’t have any trouble hitting his mark. Tourists began flooding into the tasting room as soon as doors opened last July with the brewery’s reputation spreading like wildfire on social media. People looking for something to do after snowmobiling or dog sledding are among Svalbard Bryggeri’s biggest fans. And according to Riis, no one has ever left without a big smile. With years of experience as a brewer, he knows what lies ahead. At this point, there’s no looking back. The brewery is flying high and Riis has already bought his own snowmobile, becoming a fixture around town with his jaunty demeanor. Running your own brewery in a place known for its laid-back lifestyle isn’t half bad, but it’s the nature that captivates him. 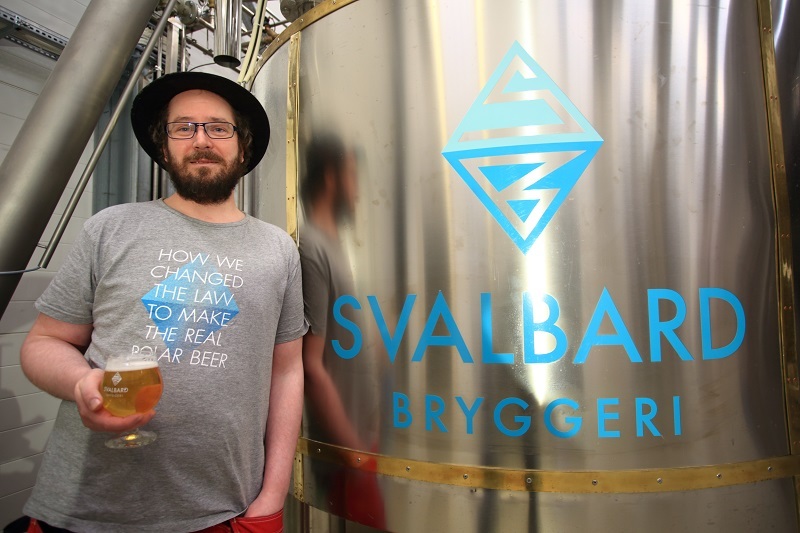 Some of that same magic is helping make Svalbard Bryggeri a thriving brewery, offering beer lovers a chance to fall in love with a new beer at the top of the world.